There has been much discussion among hunters and landowners over the past several months regarding the potential expansion of an antler-restriction regulation into their counties. During the months of February and March 2005, Texas Parks and Wildlife Department (TPWD) conducted 28 public scoping meetings scattered throughout the state to discuss the results of an experimental antler-restriction regulation within the Oak-Prairie region of Texas, and to gauge the interest for such a harvest strategy in other parts of the state. While greater than 90% of the attendees at those public scoping meetings requested TPWD to propose an antler-restriction regulation, our biologists noticed that there were some who did not understand the potential regulation proposal, nor the purpose for such a harvest strategy. This web page is intended to provide Texas landowners and hunters a comprehensive overview of this antler-restriction harvest strategy. Encourage landowners and hunters to become more actively involved in better habitat management. This regulation, which has been in effect since the 2002-03 hunting season in the 6 aforementioned counties, is designed to reduce the intense hunting pressure on bucks, particularly young bucks. As can be seen in the chart below, the proportion of bucks <3.5 years old in the harvest dropped from 79% (prior to the experimental regulation) to 29% during the 2004-05 hunting season. Prior to the regulation, only 20% of the harvested bucks were at least 3.5 years old. However, during the third year of the experiment, 71% of the harvested bucks were at least 3.5 years old. It is important to note that buck harvest dropped 38% during the first year of the experiment, as compared to the average harvest from 1997-2001. However, harvest during the second year of the experiment (2003-04) exceeded the 5-year average prior to the regulation change. This may be considered a 1-year "sacrifice" for those accustomed to bagging a buck annually; however, modifications to this regulation (described below) should lessen the severity of the "sacrifice." Can You Place So Much Confidence in a 3-Year Study? Why Don't You Try This on Wildlife Management Areas First? We will continue to keep a close eye on population and harvest data in order to evaluate the effects of regulations on the population. Any regulation that has an unexpected adverse impact on the population should be, and will be, revisited. The potential expansion (into other counties) of this antler-restriction regulation is not based only on the 3-year experiment in 6 Oak Prairie counties. TPWD has implemented this type of harvest strategy on numerous Wildlife Management Areas (WMA) for a number of years, where similar results have been observed. There are minor differences from one WMA to another. For example, the inside-spread limit utilized on the Kerr WMA has been 15" rather than 13". We actually have had a number of constituents asking us to consider a wider spread limit for the county regulations. Utilizing tools such as the photo below has enabled hunters to easily judge a 13" inside spread; whereas, a 15" spread restriction may be more difficult to judge. Besides, harvest data indicate that a 13" spread restriction is adequate to add at least 2 years to most of the better quality bucks. Can Data Obtained From Harvested Deer (as opposed to live deer) Support Such a Regulation? Data we collect from cold-storage facilities are indicative of the harvest, and provide a good index to the age structure of the population. If the number of mature bucks in the harvest increases significantly over a period of years, while overall buck harvest does not decline (and other factors such as season length and bag limit remain constant), then there is an apparent increase in the number of bucks surviving to older age classes. In the graph above, you will notice that only 4% of the buck harvest was comprised of bucks 4.5 years old or older - prior to the experimental regulation. Mature bucks in the harvest increased to 23% the first year simply because fewer bucks were harvested that year (i.e., "sacrifice year"). However, mature bucks made up 22% of the total buck harvest the following year, when more (more than the 5-year average prior to the regulation change) bucks were harvested. This is a very strong indication that the age structure of the buck herd is rapidly improving. Are Your Harvest Data Valid Since You Are Not Including the Deer that Were Transported Directly to the Locker Plants in Houston, Dallas, San Antonio, etc.? Of course. We are obtaining a sample, rather than conducting a census. We collect a random sample of sufficient size to report these figures with a high degree of confidence. As we move forward with our data-collection procedures, we will follow a design that will allow us to report harvest data with 95% confidence, and will allow us to detect a 10% change in the population over a 5-year period. If this type of hunting regulation is proposed for any other county in Texas, the proposal will read exactly as written above. You will notice that the criterion for 6 points on an antler was removed in an effort to simplify the regulation. Three years of harvest data indicate that less than 2% of all bucks harvested were legal based on that criterion alone (see table below). 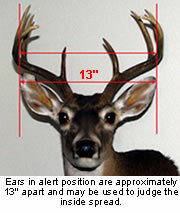 In other words, most bucks with 6 points on one antler also have an inside spread of 13 inches or greater. There was no biological reason for maintaining that as a criterion for a legal buck; therefore, we are proposing to simplify the regulation by defining a legal buck based on only the 2 criteria listed above. How Can TPWD Assume What Works in Those 6 Experimental Counties Will Work in Other Ecoregions Within Texas? Heavy hunting pressure is not a factor of habitat conditions. When so few bucks "slip through the cracks" and reach maturity, there is an obvious problem with hunting pressure on young bucks. This strategy will reduce hunting pressure on most immature bucks, whether they're walking in the Pineywoods, Post Oak Savannah, Cross Timbers and Prairies, or Edwards Plateau. Why Isn't TPWD Looking at Proposing This Regulation for my County Right Now? This question has become increasingly common in the past couple of months, as the interest in this type of regulated harvest strategy continues to build. There certainly are more one-buck counties (than those indicated in the map above) in which greater than 60% of the harvest is comprised of bucks ‹3.5 years of age. However, this sort of regulation requires a fairly extensive education effort, as we want to be sure that hunters are well aware of the regulation change. Education efforts will be in the form of slide shows (at public meetings), video tapes (hunter education classes), wallet cards (which thoroughly explain the regulation and give examples of bucks that are and are not "fair game"), this website, etc. Given the fact that many of our biologists and technicians are responsible for 3-5 counties each (if they're lucky), we simply do not have the manpower to extend this education effort in many more counties than those indicated above. Therefore, we chose to focus our efforts in those counties where we were hearing the most interest. We suspect that the regulation in those counties will serve as an educational tool for the remaining one-buck counties in an area, and we do not foresee an extended waiting period for additional counties that want this regulated harvest strategy. Why add a second buck to the bag? And why make "spikes" legal? The table to the right shows the number of legal deer brought to the voluntary check stations during each year of the experimental regulation. During the first year, roughly 43% of all bucks checked were "spikes." For the purposes of this report, the term "spikes" includes all deer with at least one unbranched antler. The statewide harvest data indicates that 95% of all deer with at least 1 unbranched antler have less than a total of 4 points. During the second year of the regulation, only about 31% of all bucks brought to check stations were "spikes." The harvest of spikes dropped to only 20% (of the total buck harvest) during the final year of the experiment. This is not a result of there being fewer spikes during the second and third years. Rather, this is a result of far more bucks with an inside spread of 13 inches or greater - simply because there were a lot more 3.5- and 4.5-year-old bucks than ever before. With so many more "quality" bucks available for harvest, and only 1 buck tag available, few hunters chose to use their only buck tag on a spike. The end result is high-grading of the buck population. Allowing "spikes" to be available for harvest, and including a second tag to be limited to those poorer-quality animals, provides more hunting opportunity while minimizing the risk of high-grading. Many of the southeastern states have antler-point restrictions, where they protect they bottom end of the herd, and make the better quality yearlings vulnerable to harvest. For example, one state has a rule that protects all bucks that don't have at least 3 points on one antler. Therefore, the 6-point and 8-point yearlings are harvested, and the bucks with less antler potential (e.g., spikes) are protected. Another state has a 4-point rule, which protects all bucks with less than 4 points. These and other southeastern states are taking a hard look at their data, and questioning whether they should be continuing with such a harvest strategy. Most biologists agree that improving the age structure of a buck herd is a legitimate goal; however, many southeastern biologists simply don't think that protecting only the poor-quality yearlings has been the best approach. We (TPWD) agree. Whether you're breeding horses for speed, chickens for egg production, or whitetail bucks for bigger antlers, it is not advantageous to remove the best quality animals and keep the poorer-quality animals (i.e., remove the fastest horses and keep the slower ones to breed). Will This Strategy Select For "Narrow-Rack" Bucks? Some people interpret this as a strategy that will select for branched-antlered deer with less than a 13" spread. Well, it will - until those deer reach the age at which their spread exceeds 13". In other words, this strategy will select for better quality (i.e., branched antlered) young bucks, and will allow most of them the mature before they are available for harvest. It will eliminate the risk of high-grading, which is a likely outcome when many hunters choose to use their only buck tag on a 6-point or 8-point yearling instead of using it on a spike. Our constituents are correct when they say there are some "narrow-rack" older bucks out there. They are also right when they say a portion of them will be protected under this strategy, which is not desirable. We don't claim that this strategy has no flaws. We must be mindful of the long-term effects. This strategy will allow hunters to "turn-over" the population. Based on 30 years of solid data (described below), from research that was designed to answer these questions, those older "narrow-rack" deer likely were spikes as yearlings. If hunters take advantage of the extra tag (assuming this gets proposed and adopted), they will greatly reduce the incidence of those older "management bucks" that slip through the cracks. By the way, the incidence of mature bucks that would not be legal under this strategy is much lower than what one may expect. In most of the areas where we're considering such, less than 5% of the mature bucks would not be legal based on these criteria. But in those same areas, only 5% of the harvest consists of mature bucks!!! They simply aren't living that long. Having carried the "high-grading" discussion this far, we must be very clear with one important point...This antler-restriction regulation is NOT a trophy-buck management strategy. Will it result in better quality deer? Possibly. It will result in more mature age-class bucks and age is one of the 3 main factors contributing to antler development. While this is not a trophy-buck management strategy, most hunters and landowners probably would agree that it would be irresponsible of TPWD to propose a regulation that would have an adverse effect on antler quality. Protecting the bottom end of the herd (i.e., spikes and 3-pointers) would do just that. Therefore, we're considering a much more proactive approach to improve the age structure of the buck herd, while not compromising the quality of those bucks that reach maturity. Won't the Second Buck in the Bag Result in an Over-Harvest of Bucks? HOW CAN YOU REDUCE HUNTING PRESSURE ON BUCKS BY ALLOWING AN ADDITIONAL BUCK TO BE HARVESTED? The incidence of spike-antlered bucks is much lower than what many people think. Depending on the region of Texas and the severity of drought, the incidence of spikes ranges from 25-33% of the yearling cohort. Currently, 100% of the yearling bucks are vulnerable to harvest. This strategy protects 67-75% of the yearling bucks - which happen to be the better quality yearlings. Why Not Just Provide a Free "Spike Tag" - With no Spread Restriction? Antler restrictions may be considered in some counties because landowners and hunters wanted an extra tag to help them better manage the herd. Based on years of population data and harvest data, we cannot justify giving a "free spike tag." Such a tag would have to come with stipulations to eliminate the risk of over harvesting the buck segment of the population, as well as the risk of high-grading. So while some may think that the extra buck in the bag is a "ploy" to make antler restrictions more palatable, we are actually considering antler restrictions in some cases to make the extra tag feasible. We're simply trying to come up with a strategy that meets the needs and wishes of those managing the resource. What About the Kids? Why Would You Want to Restrict Our Youth From Taking a Buck of Their Choice? So far, all indications are that youth hunters are benefiting from this regulation. A comment that we routinely hear from the experimental counties is, "My kids are finally seeing bucks when we go hunting! We sat for years without seeing any buck, but now we see numerous bucks during our hunts." Other comments from those accustomed to seeing bucks - but young ones - include, "We're actually seeing rutting activity now! Improving the age structure of this buck herd is making our hunts much more enjoyable, because we're seeing activities that you just don't see when you have such a young buck population." In fact, 70% of survey respondents (in the 6-county experimental area) in the fall of 2004 said that they enjoy hunting more now than they did prior to the experimental antler-restriction regulation. Furthermore, 78% of survey respondents indicated that this regulation is not having an adverse effect on youth hunting. Data from our Big Game Harvest Survey are consistent with the latter statement, where youth hunting participation in those 6 counties apparently has increased since 2001, whereas statewide youth-hunting participation has remained relatively constant (and lower than in the 6-county experimental area). TPWD would not consider a regulation that was expected to have an adverse impact on youth hunters, and we will continue to closely monitor youth-hunting participation in an attempt to evaluate the effects of our regulations on youth hunters. Shouldn't We Be Concerned About Inadequate Doe Harvest? Hunters and landowners are right to assume that a buck-harvest regulation does not directly address the need for doe harvest in many areas of the state. We are addressing the concerns regarding more flexible doe-hunting opportunities with other proposals, some of which were adopted by the TPW Commission in April 2005. Some areas have deer populations expanding beyond the level of which that habitat can support, and we are addressing that problem. Other areas do not have a population that can withstand more liberal doe harvest. So we have to balance our population data, with our knowledge of habitat conditions, and with our goals of increasing hunter opportunity. It would be irresponsible of TPWD to propose regulations based on opinions and speculation. We must rely on strong data produced from well-designed research projects and regulatory surveys. Having said that, common sense supports these hard data. Here are a few scenarios to consider: You own a ranch in good range condition. Each year when it's time to take some animals to the auction barn, you take the calves that are just a little bit bigger. You keep the calves that are just a little smaller (bulls and heifers for replacements). You sell your fastest horses because you can get more money. You keep those that are a little slower. Good milk cows draw a good price, so you sell those that produce the most milk, and you hold back the others. You do this every year because you can get more money for the "better" animals. You keep the rest and let them breed. Or do you? The content within this document describes an opportunity for Texas landowners and hunters. While the feedback obtained from 28 public scoping meetings during February and March 2005, strongly (>90%) requested TPWD to propose this antler-restriction regulation for the 2006-07 hunting season, we will continue to record public opinion through spring 2005 before we proceed with a proposal. Provided that public opinion continues to strongly support such a harvest strategy, we will draft a proposal in the fall of 2005, and request permission (from the TPW Commission) to publish in the Texas Register for approximately 60 days, beginning shortly after the Regulations Committee meeting in January 2006. The proposal would be open for public comment during that 60-day period, and will be adopted or denied by the TPW Commission in April 2006.